If you’re unconvinced that an economic powerhouse such as the U.S.A has the potential to be like anything besides the glitz and glamour portrayed in Hollywood movies, then you could do with a trip to New Mexico to show you a different side of the nation entirely. Before the trip, I could have written everything I knew about New Mexico on the back of a postage stamp and still had space left over. These two days in the state were not the two days which particularly jumped out at us from the itinerary we were given at the start of the trip, probably because we had so little idea of what to expect in comparison to the things which we had heard about and couldn’t wait to experience in the likes of New Orleans and Las Vegas. With the help of a few guidebooks we filled ourselves in on the basics of New Mexico as we made a modest entry into the state from Texas. The sense of ambivalence is apparent in the basic facts alone – New Mexico is the 5th largest state in terms of area size, yet only 14 of the 50 states have a smaller population. It also has the second-largest population of Native Americans and the highest percentage of Hispanics; a consequence of Spanish colonists in the 16th, 17th and 18th centuries. These facts allude to the two most prominent characteristics of New Mexico – 1) There is a lot of uninhibited land and 2) There is a huge sense of Hispanic and Native American presence. If there’s one way I will remember New Mexico, it’s by masses of sand-coloured, cactii-populated plains and the feeling that I’m no longer in North but Middle America, despite only being a few hours away from the familiar, all-american feels of Texas. Our first New Mexican destination was the Carlsbad Caverns National Park, part of the Guadalupe mountain range in southeastern New Mexico, a popular tourist destination for nationals and also a UNESCO World Heritage site. 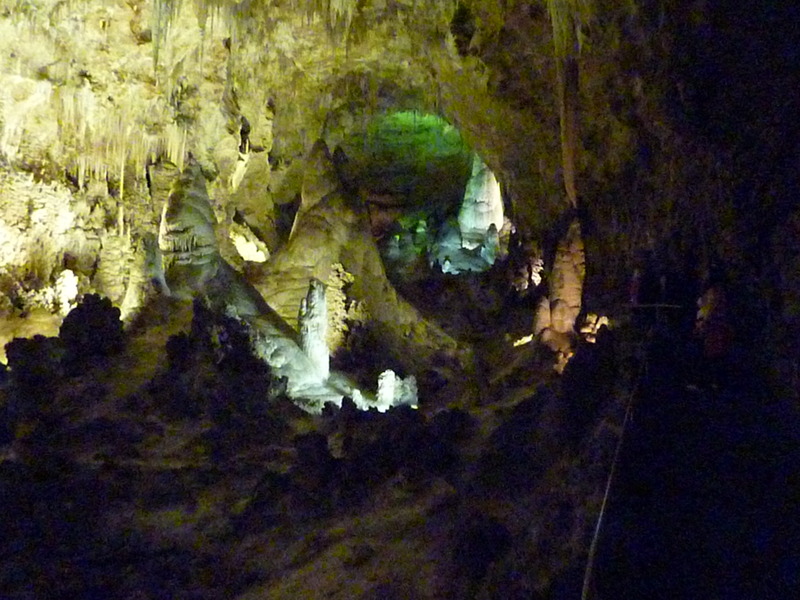 Carlsbad Caverns is, as the name suggests, a set of underground caves consisting of some of the most beautiful chambers and limestone formations I’ve ever seen. There was a lot of walking and steps involved, but it was certainly a different way of seeing America. By the time we’d finished walking the designated route around the caves, we were all very much relieved to discover that an elevator was waiting to take us up to ground level. Inside the elevator, a guide offered us a final demonstration of the magic which the caves had to offer, “And if I flick off the lights, you’ll see something real interesting…” Cue a dozen tired faces which were amusingly unenthused by the apparent formation now visible behind the glass. Once we had all re-grouped, we got back into the Trek van and made our way to the campsite we were staying in that night. On the way, we stopped off for a genuinely authentic New Mexican dining experience in a Chinese all-you-can-eat where I enjoyed a serving of sarcasm alongside my sweet and sour pork. 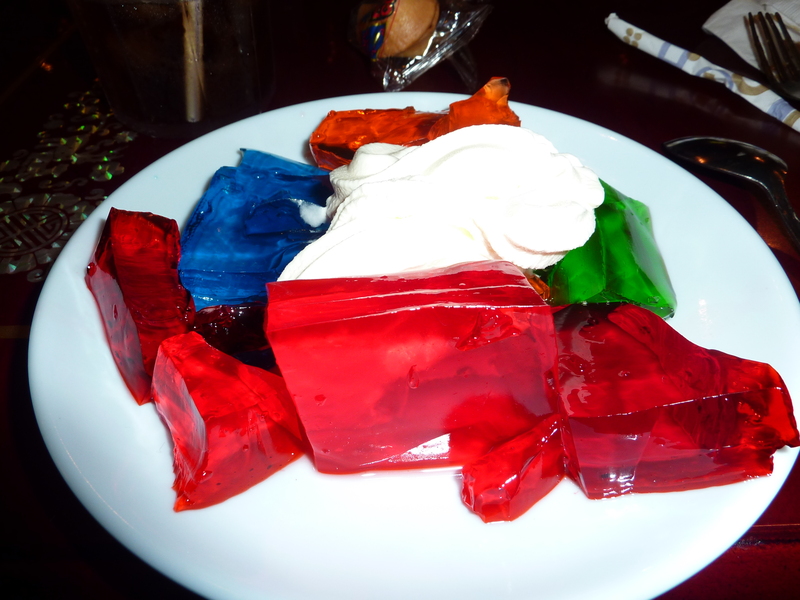 The food was delicious though, and even better was the dessert! Blue jelly is the most amazing thing I ever tasted in my life, and the e-number induced hyperactive fit which followed consumption gave a probable explanation as to why we don’t have it here, in the overtly health-conscious U.K. This made for an interesting visit to Wal-Mart where we stocked up on alcohol and snacks for the evening’s campfire. I’m pretty sure that the name of the place we stayed was the ‘Carlsbad KOA’ camping ground but two and a half years of memory may have eroded that particular fact from my memory. By the time we arrived there, it was already dark, so we were limited in what we knew of the area immediately around us. The campsite contained many cute little wooden chalets and most importantly, a site for a small campfire. It was a lovely evening drinking beer, toasting marshmallows and eating junk food. Around us we could see nothing besides a nearby power line piercing through the indigo skies. Mandy told us that the town of Roswell – site of the infamous UFO conspiracy of 1947, was not too far away from us. Desolate New Mexico was seeming creepier and creepier by the minute, but thankfully we had plenty of Budweiser to keep our fright in check. After an enjoyable evening, daylight dawned and we got back into the van to continue our tour of New Mexico. 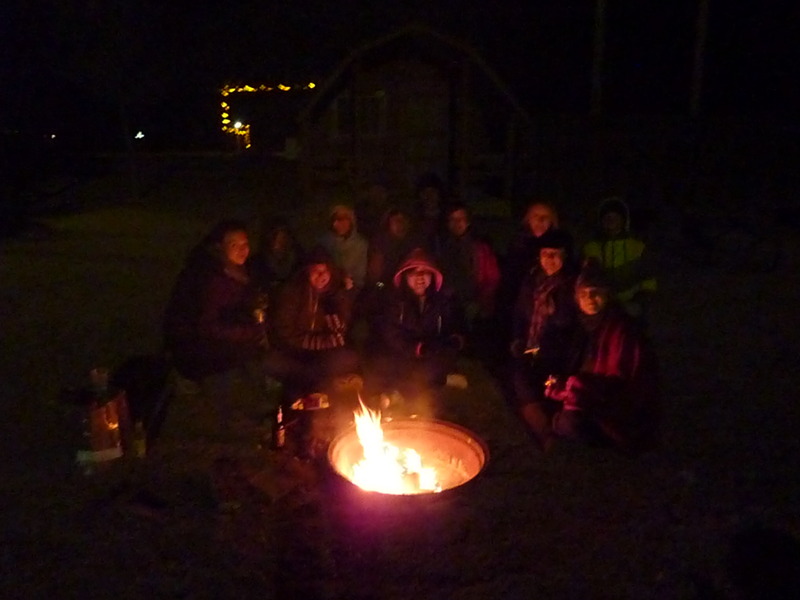 The smell of the campfire had very much become entwined in the fabric of our jackets, much to our dismay, and many of us battled in vain with deodorant canisters to try and solve the problem somehow. Mandy took us through Roswell, a small and empty town with many references to aliens and UFOs where we took a few photos and bought some snacks in a gas station. 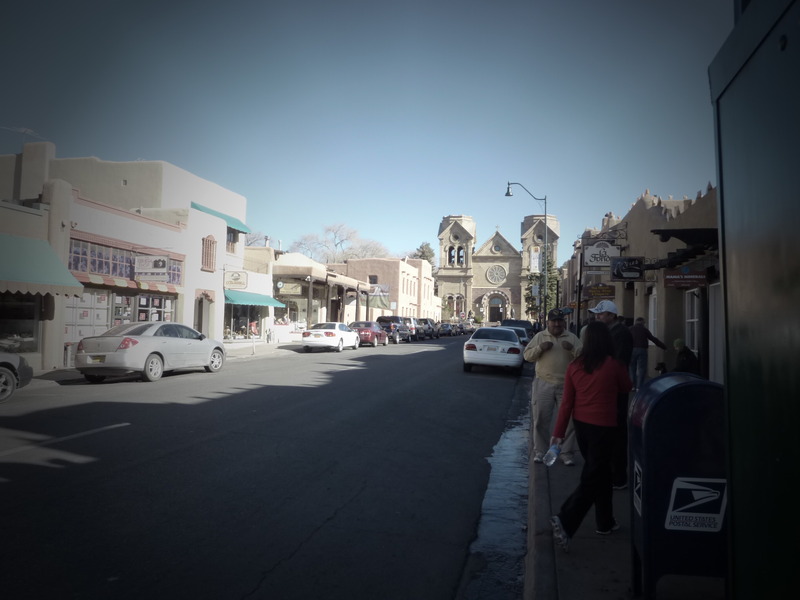 We continued on to Santa Fe, the state capital of New Mexico and a city which looked like no other I’ve seen in the USA. Hispanic influences are particularly prevalent here, and all buildings must be one of twenty-something acceptable shades of brown. This combined with the low-rise buildings and beating sunlight made me feel as though I was in a country much more South. We spent a couple of hours walking around, sipping Starbucks coffee in the town square and nosing at the handmade crafts. I bought a beaded bracelet handmade by a lady of Native American descent. If it weren’t for baggage restrictions on aeroplanes I could easily have bought a lot more of the crafts, too. Arts and crafts were central to our Santa Fe experience, and what else would you expect from a city influenced by so many cultures, as well as once being the home to Georgia O’Keeffe. Santa Fe is also listed as a city of Craft and Folk Art within UNESCO’s Creative Cities network – just one of four in the world. Its a place I wouldn’t mind going back to at some point; as though it was small, it had a certain atmosphere of intrigue about it, one which I’d have liked to have explored further had we not been under time constraints. The date was November 26th 2009 and it was Thanksgiving. We were to celebrate it in the small town of Taos in northern New Mexico, a place often frequented by those visiting the nearby ski resort. It’s strange to imagine the climate of New Mexico – warm and arid, yet with the occasional cluster of snow-peaked mountains. 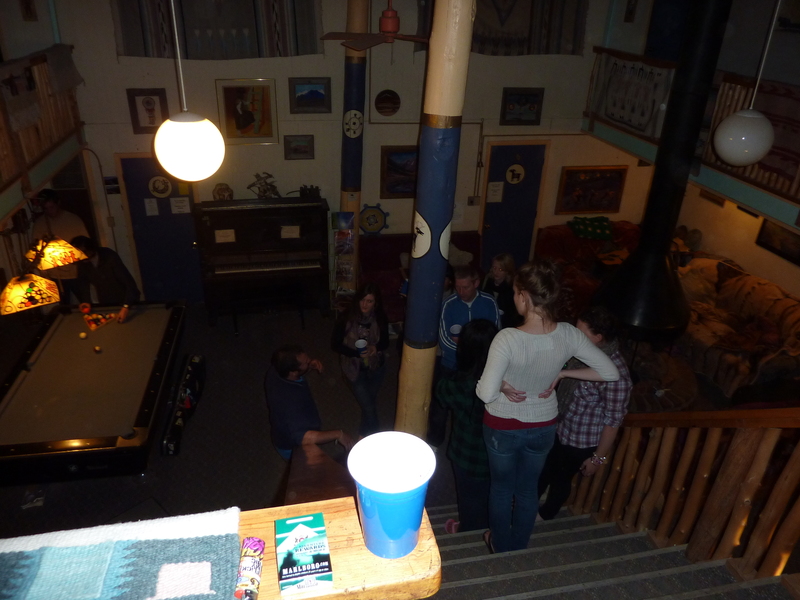 We didn’t have a lot of time to explore Taos properly, but did have an evening to remember at the Abominable Snowmansion hostel, where we were staying. The snowmansion was “a big ol’ scary house with lots of hippies and things” and the owners made a huge, traditional turkey dinner, not only for ourselves but for various other visitors too. We received an explanation of what Thanksgiving was all about and, in truth, I’m still not fully aware of the story, but everybody was in a good mood and that’s the main thing. The hostel had a particularly homely feel, with cushions, blankets, a piano, guitars, a pool table, board games and many old and exceptionally random books. A hippy haven, it also boasted an incredibly cute ginger cat who clearly reveled in all the slices of turkey everywhere. Our group celebrated Thanksgiving in our own little way with a white elephant gift exchange. Each of us had bought a gift from somewhere along our journey, wrapped it (although, since none of us had wrapping paper, we just used available alternatives such as crisp wrappers and carrier bags) and placed it in a pile in the centre. We then took it in turns to select a present. I was really pleased with mine, a pair of Texas-star earrings and ‘I love Austin’ sticker which Vicky had bought. Min seemed pleased to pick out the country music c.d I had contributed to the presents. We shared a lot of laughter that night, our first Thanksgiving. 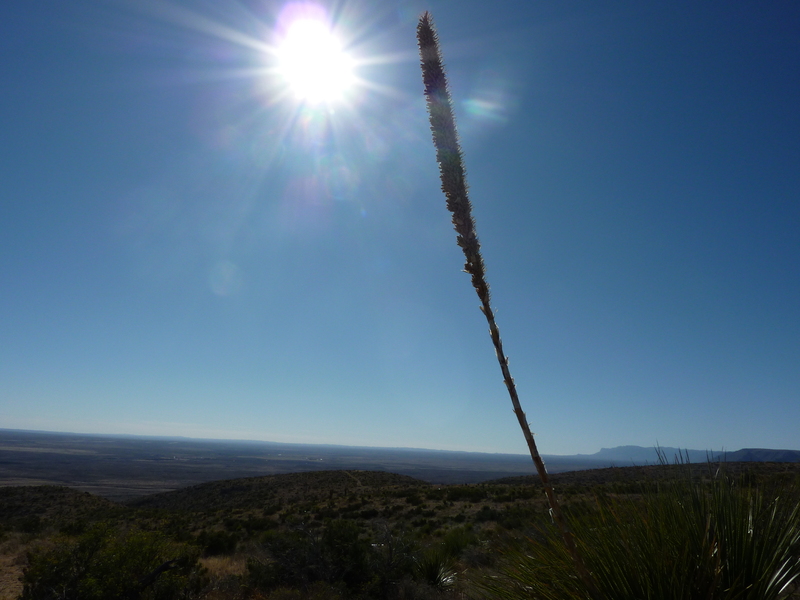 It seemed quite symbolic of our overall time in New Mexico – chilled, fun and something that little bit different to the norm. Up next – Arizona/Utah and the Monument Valley Experience. Santa Fe is the home of my heart. I hope you do get to visit it in depth one day. It is so very special.